Last week for Supper Club, I made my very favorite appetizer. This app also happens to be E-A-S-Y which was a huge plus in my book. Not a single crumb remained! Remove brie from paper and cut top rind off. Pop open your can of crescent rolls and separate into two main square-shaped pieces of dough. Press perforated seams together lightly. Put one square under cheese round and top the cheese with preserves of your choice. Add the second square of the dough on top of the cheese, and slighly press together so brie is totally covered. Place on a baking sheet coated lightly with nonstick spray, and bake according to crescent roll package directions. 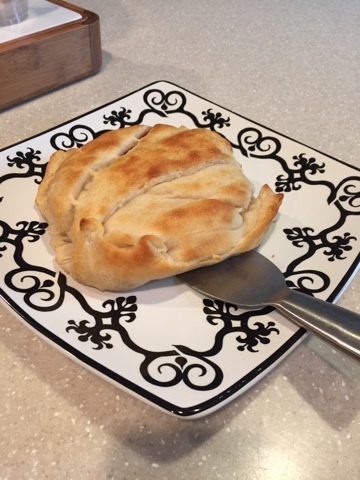 No crackers needed ... just delicious melted brie wrapped up in flaky pastry crust! YUM anything with brie is a win in my book! YUMMM!!! Can't wait to try this! That sounds amazing, and I love that it's simple! I like to make this with red pepper jelly on top! Talk about yum! this is also really good with gouda and spicy brown mustard!! Looks yummy and even better---easy! This looks so yummy! I'll definitely be making this the next time we have company! YUM! I've seen this floating around pinterest and I always think it sounds SO good! I never knew just how easy it was!